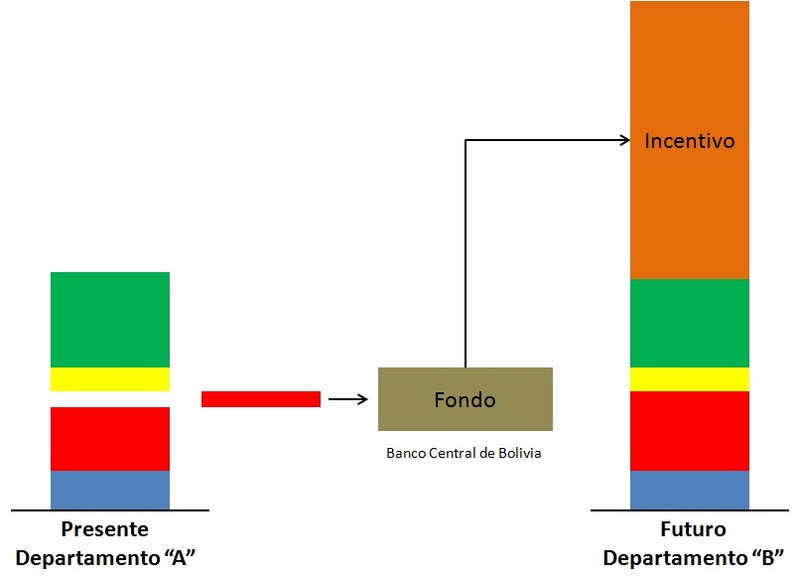 Thanks to a previous post about Efficient Taxation (link) I have information about the Fiscal Incentive Law for the upstream oil sector currently being discussed in the Assembly (former Congress) of Bolivia. For this reason I want to share with you my understanding of this text. I'll try to point the main aspects of the project of Law, perhaps when the regulatory framework will be public, I'll discuss more specific details. First let me explain the general framework of analysis, as usual will use some figure to illustrate my ideas. 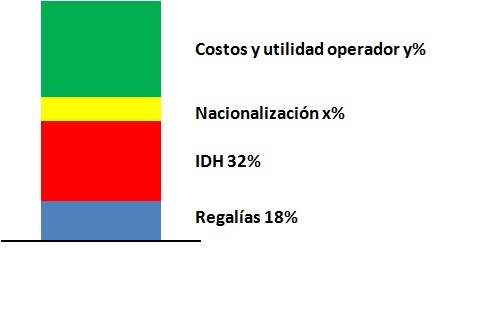 The following figure shows, in general, how the upstream hydrocarbons "cake" (gross revenues at wellhead) is divided today; 18% (as royalties) goes to producing department and General Treasury of the Nation (TGN); the Direct Tax on Hydrocarbons (IDH) of 32% goes to local governments, municipalities, universities, TGN, Indigenous Fund, etc . ; x% goes to the national oil company (YPFB) result of so-called "nationalization" and y% goes to the private operator to cover its costs and obtain the corresponding utility. If my reading of the Article 12 (of the project of Law) is correct, then all institutions that receive resources from the Direct Tax on Hydrocarbons (IDH) must give 12% of these resources to the Fund. Now who manages the Fund? What is the amount of these resources? 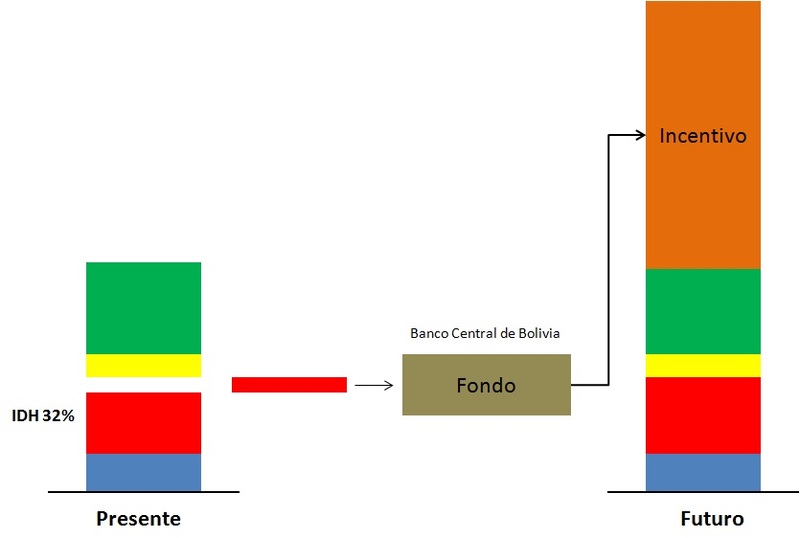 According to Article 13, the Fund will remain in custody of the Central Bank of Bolivia (BCB) under the guidelines that this institution has for the managements of international reserves, see the figure below. Moreover, if the international price of oil by 2016 is between 50 and 60 US$/barrel, the Fund could receive between US$ 170 and 200 million for that period; accumulated until 2019, could reach a figure between US$ 680 and 800 million. Now the incentive. The central idea is that an operator (private or the state company YPFB) can get an amount of money per unit of additional production of oil/condensate. What is additionalproduction? According to the wording of the project of Law, this "extra" comes from new investment in exploration (made before 2019) and/or production above a "base line". In short, all "new" production is subject of this incentive. Lets see an example for an oil field under current price conditions. Please, dear reader, pay attention to the following figure where the incentive in orange color is displayed. 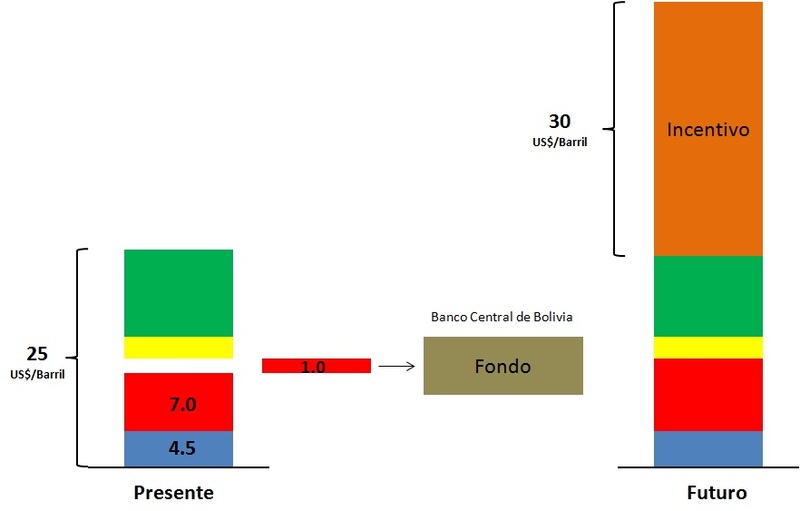 Note several things: 1) future production (thanks to the incentive) still pays royalties (blue), IDH (red) and "nationalization" (yellow), but also receive an incentive (orange); 2) future production also contributes to the Fund and; 3) note that these figures are per unit produced ... do not worry, I'll explain why below. How this subsidy is provided by the government? The mechanism is quite complex. The operator requests the incentive to the state oil company YPFB; YPFB in turn sends the request Ministry of Economy and Finance, who in turn requested the permission from the Ministry of Hydrocarbons and Energy. Once this Ministry it authorizes the amount of incentive, the Ministry of Finance issued Tax Credit Notes (NOCRES) using the resources of the Fund, these NOCRES are pay to YPFB, who finally sends this to the operator. No doubt it's a complex institutional engineering. Now some questions arise from this incentive scheme. Question 1: What happens when the fields in question belong to different producers departments? That is, something like what I show in the following figure. Imagine that the Department "A" provides resources from the IDH to create the Fund, but it turns out exploration activities are conducted in the Department "B" for this reason, the Department "A" will not (as expected) harvest this new investment Will there be some provision for it? Question 2: Is it possible to "secure" the Fund? The reader will recall that in a previous paragraph I calculate how much the Fund could receive until 2019. Why I did it? It happens that the project of Law mentions that this incentive will be given to investments made before 2019, that associated with the fact that the exploration period lasts between 5-7 years, suggests an accumulation in early years of the Fund and after 4 or 5 years we would have a period of "de accumulation". This mechanism works if the resources of the Fund are prudently managed. Question 3: Is it possible to regulate the contributions to the Fund only will carried out under reasonable conditions of international oil prices? A personal opinion is that a mechanism of this nature should have been implemented when the international oil prices were high. In this sense, it may be prudent to set positive contributions to the Fund only when international oil price exceeds a certain limit. I think the management of this mechanism will be a nightmare and frankly, I don't consider that this Project of Law will solve the main problems of the hydrocarbon sector in our country. I think it's time to discuss a new Hydrocarbons Law to allow, progressive and efficient tax rates, clear rules to attract investment, eliminate subsidies, consolidating the corporatization of YPFB, open new markets, promote exploration in non-traditional areas, a honest discussion about the relationship of the sector with environment institutions and indigenous peoples, industry information, etc. I think it's time to stop the speeches and do real work. No doubt that this project of Law is the result of long hours of discussion and analysis within the executive power (Ministries), but always within the usual political constraints. I understand it's difficult to disentangle politics, particularly the political/parties pressure, from the hydrocarbon debate in a country like Bolivia; however the data ... those stubborn data (to quote my good friend Milton) about reserves, prices, costs, production and markets bring us a reality that cries out for a genuine national commitment. 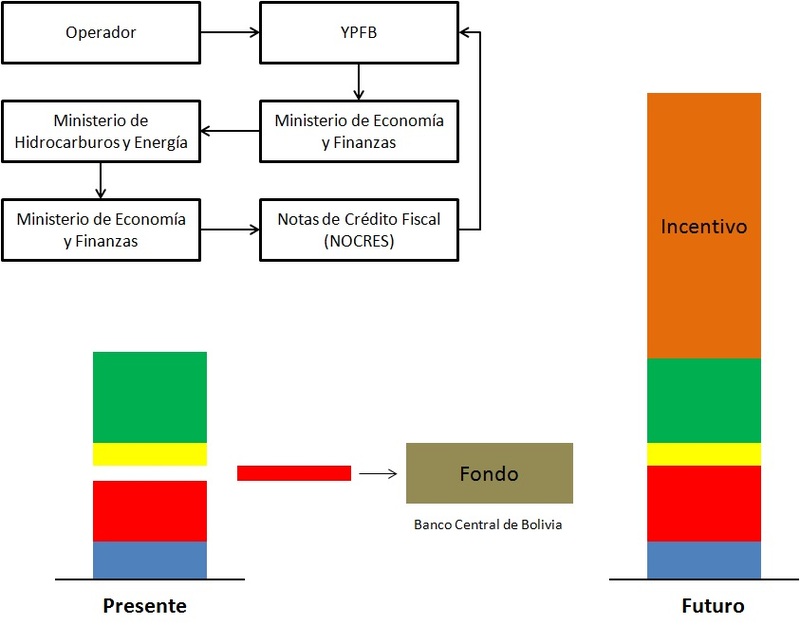 I'm currently looking into Bolivia's fiscal regime of the hydrocarbon sector and came across you website! Many thanks for your the useful blog posts! I was wondering why your cost split does not include corporate income tax!? If not mistaken, the state also levies corporate income tax, correct!? And secondly, how is the split between YPFB and E&P company done? Is the rule defined by law/decret or can YPFB set the rule?